June 25, 1983. The day that Indian cricket came of age, and a match that changed the course of the game’s future. 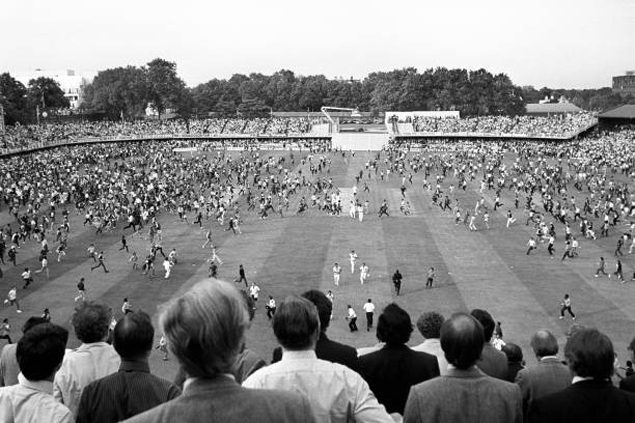 The venue was Lord’s, the spiritual home of cricket, where a packed house witnessed one of sport’s biggest upsets. West Indies captain Clive Lloyd won the toss after which the defending champions and overwhelming favourites were briefly frustrated by Kris Srikkanth’s 57-ball 38 – which included a resounding square cut for four off Andy Roberts – but a collapse from 90 for 2 left India undercooked. Once Srikkanth and Amarnath, whose sheet anchor 26 would prove to be invaluable, were separated, Yashpal Sharma’s run of solid form ended in failure and the all-round trio of Kapil Dev, Kirti Azad and Roger Binny all stumbled. Sandeep Patil got a bit of support from the tail to get the total to 183, crucially ensuring India batted for 54.4 overs. Balwinder Sandhu took new ball and gave India an immense breakthrough, foxing Gordon Greenidge with an inswinger that hit the West Indies opener on the fingers and crashed onto the stumps. It was the first of two pivotal moments. The second, Kapil’s running catch to dismiss the dangerous Viv Richards, was the turning point. After hitting three successive fours, Richards sized up a length ball that he thought would fetch him a fourth boundary, except the ball took the top part of his bat and spiraled in the air over midwicket. Kapil never lost sight of the ball as he sprinted backwards about 20 yards, smiling as he ran. In the end, he covered good ground and pouched the catch that won the match and sparked manic celebrations back home. Suddenly, West Indies were 66 for 4. Lloyd, struggling with a hamstring strain, departed next when he drove Madan Lal to Kapil in the covers, to make it 66 for 5. It got worse at 76 for 6, but a stubborn rear-guard effort between Jeff Dujon and Malcolm Marshall threatened to undo all the good work. Kapil then turned back to Amarnath and, in typically languid style, he dismissed both batsmen to leave West Indies at 124 for 8. Jogging, hiding the ball behind his back, hitting the seam and extracting extra bounce, Amarnath stunned the defending champions. The final nail was hammered when he trapped Michael Holding lbw, a scene captured on television and photographs for all Indian fans to cherish forever. “Mohinder has the laziest, relaxed way of bowling, as if he’s jogging, but these are deceptive moves as he trips them by making the ball wobble and induce all kinds of indecisiveness in batting,” wrote Kapil years after Indian cricket’s most famous day. It was a fitting attribute to a fine allrounder who won the Man-of-the-Match award in the semi-final and final.